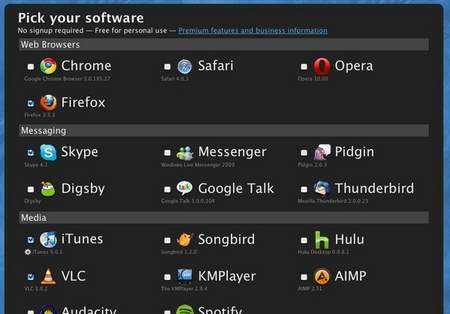 Ninite is an intuitive utility that allows you to customize all your favorite apps into a single installer. All you need to do is tick the checkbox for the application you want installed, download the installer and let it run. Ninite does the fetching of the installers for you. This is a boon for people who are doing a fresh installation of their Windows box and Ninite is especially welcome now that Windows 7 has just been released for public consumption :D.
Ninite currently supports all the popular browsers like Firefox, Chrome, Opera, etc., and includes utility apps such as VLC, Skype, Thunderbird, Adobe PDF Reader, Flash, bit-torrent tools, RealVNC, WinRAR, PuTTY, and other common apps. What’s more, if you don’t find the application that you want, you can also suggest it for inclusion. So before you install (or afterwards), head to the Ninite website. Pick your apps, download the installer, run it, and install the latest version of all your apps while having coffee :D.
Save time. Grab the must have Ninite!